OCEARCH's Global Shark Tracker lets you observe the navigational pattern of sharks that have been tagged with satellite tracking technology all for the purpose of shark conservation. OCEARCH facilitates unprecedented research by supporting leading researchers and institutions seeking to attain groundbreaking data on the biology and health of sharks, in conjunction with basic research on shark life history and migration. I love the ability to track my favorite species, but there are definitely still some bugs that need to be worked out. I tried to find a way to contact the developer directly, but no contact information seems to be listed anywhere. I have set my app to track all species of sharks, but when I click on some of the pings, it will show a picture of a shark with turtle information underneath. Annoying, but the pros outweigh the cons. 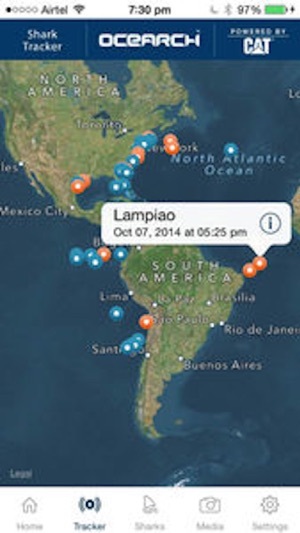 I love knowing where sharks have pinged and what species are currently in certain waters. Issues connecting, but love app and what you do! First, I love what Ocearch is doing and I enjoy this app a lot. I live in the Beaufort/Port Royal area and Ocearch has been in this area tagging sharks quite a few times, which I love following local sharks. However, I have been experiencing a lot of issues with this app as of late, continuously receiving an error message stating “issues connecting to the server,” making it so I cannot see any updated pings or information?